Fall is full of color, warm orange and red that look amazing against a blue sky on a crisp cool day. 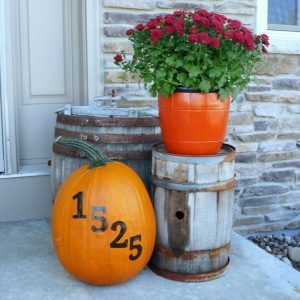 I love decorating with the traditional fall colors most years, or going neutral. 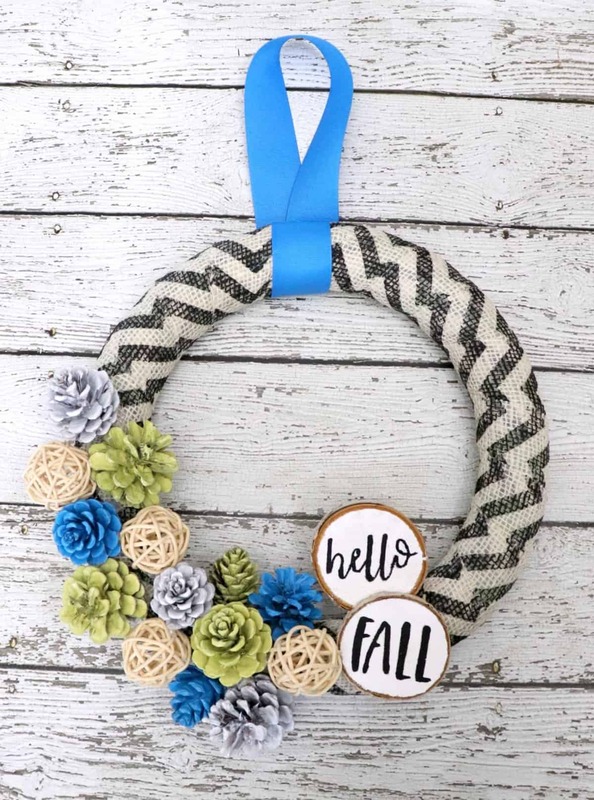 My first project of the season is this very colorful fall pinecone wreath with a mix of blue and yellow on a burlap background. This is a wreath made from items in my craft room and it came together beautifully. I love shopping my supply stash and using up what I have before buying new. 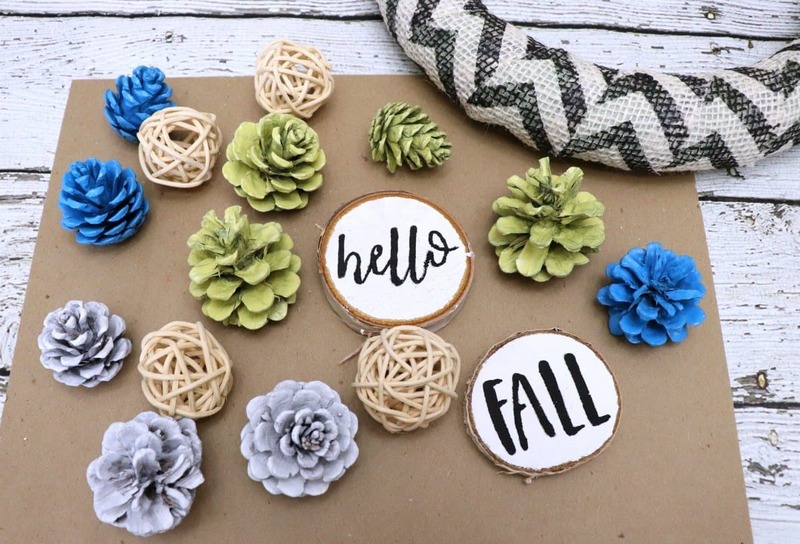 Take a look at all the pretty fall elements on this pinecone wreath and learn how to make one. 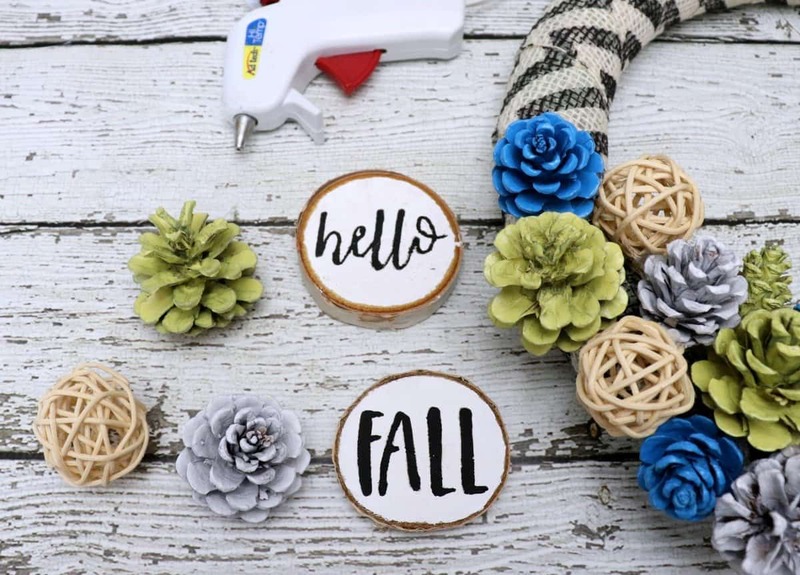 This fall pinecone wreath is made on a foam wreath form, wrapped in burlap ribbon and covered in painted pinecones and wood slices. All of these pieces we in my craft room either left over from other projects or bought on clearance at the end of a season. The wood slices were left over from these Christmas gift tags and the burlap was a Halloween clearance find 2 years ago. 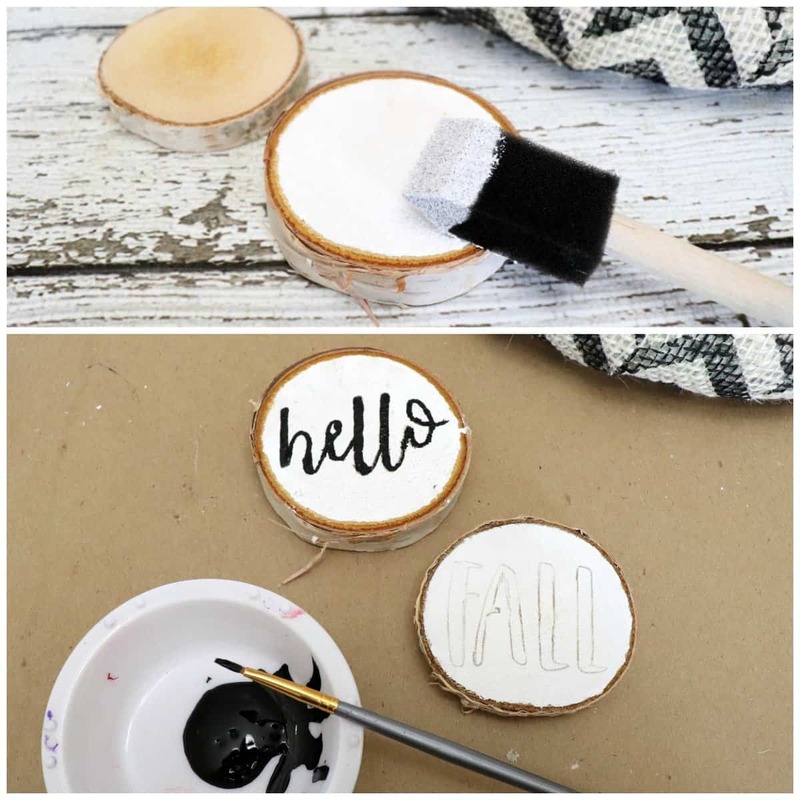 Paint – You can use the acrylic paint pictured below or spray paint. Spray paint is quicker and generally gives better coverage. 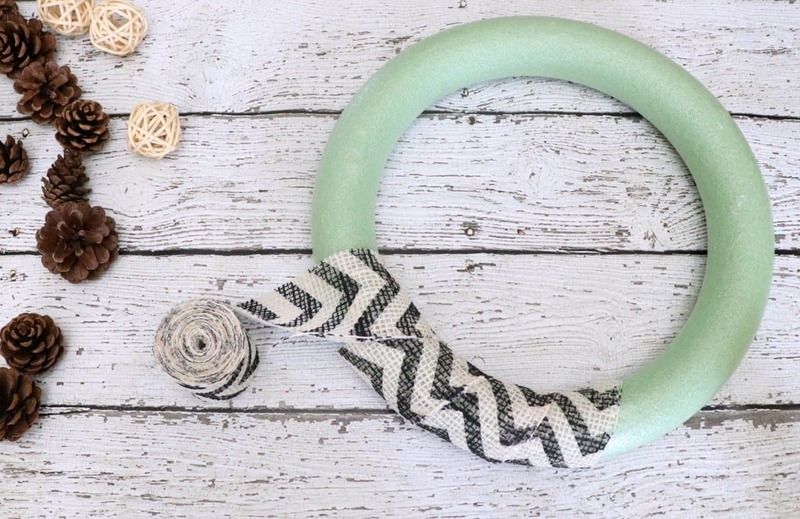 I started by wrapping the wreath form in burlap ribbon and securing with hot glue. Next I took the pinecones outside and sprayed them with blue yellow and white spray paint. Using spray paint, I was able to get into the crevices and cover them well. While the pine cones were drying, I painted the face of the wood slices white and added words first with a pencil then black paint. 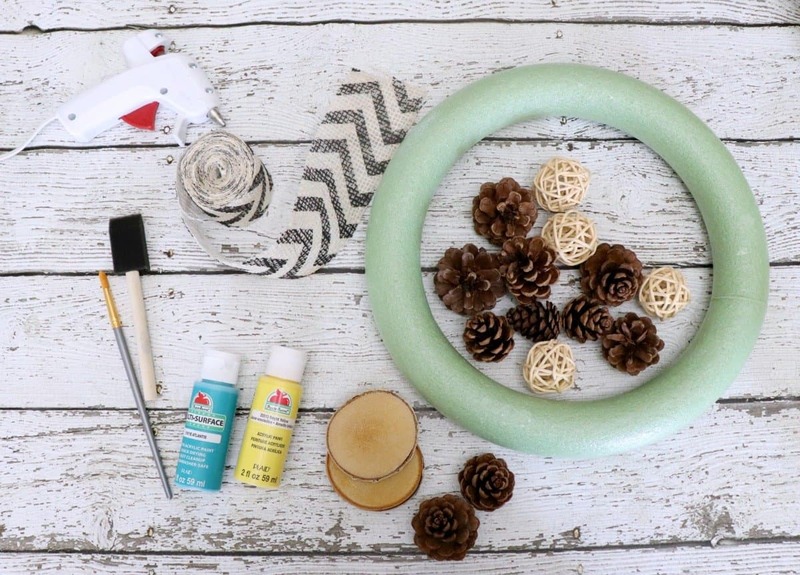 Once all the pieces we dry, I used hot glue to add everything to this fall pinecone wreath. I really can’t wait to put this on my front door, but as I write this it is only August. So I will wait, I don’t want my neighbors to think I’m crazy nor do I want to rush summer. I think this is going to be beautiful on my front door with white and yellow mums in the pots surrounding it. For now, it’s in my office looking pretty and reminding me that fall is just around the corner. Love the additions of the wood slices. I also love that you went non traditional in your colors.